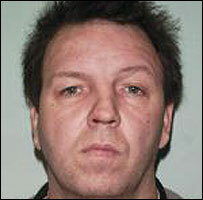 A man has been jailed for more than two years after carrying out the UK's first "web-rage" attack on an internet user. Paul Gibbons, 47, assaulted John Jones, 43, at his Essex home, after the pair exchanged insults in an internet chatroom, the Old Bailey heard. Gibbons, of Bermondsey, south-east London, tracked down father-of-three Mr Jones to Clacton, from personal details he put online. He was armed with a pickaxe handle and was with a man carrying a machete. Mr Jones was beaten and had his neck cut after going to the door of his home with a knife. "It is accepted by the prosecution that Mr Jones taunted you and dared you to go to his house where you would be greeted with weapons," Judge Richard Hawkins told Gibbons. Gibbons admitted unlawful wounding last month after the prosecution agreed not to proceed with charges of attempted murder and threats to kill. "The circumstances are unusual," said Judge Richard Hawkins after passing sentence. "This case highlights the dangers of internet chatrooms, particularly with regards to giving personal details that will allow other users to discover home addresses," said Investigating Officer Det Sgt Jean-Marc Bazzoni of Essex Police. "All the victims were targeted by Paul Gibbons following a disagreement in a chatroom and threats to kill were made on the website." Mr Bazzoni said Mr Jones' "terrifying ordeal" was a consequence of "upsetting somebody he had never even met". "The dangers of giving personal information out in a chatroom environment must never be underestimated."